Find some old paper bags, plastic bags, or even just pieces of cardboard. (Don't be afraid to find creative ways to reuse things you would otherwise throw away). Make a paste of sugar, corn syrup, and water by heating it together. When the mixture cools, spread the paste on the paper bags (or equivalent) and place strategically around the house. They are ideal if hung. How it works: The insects will be attracted to the sweet smell, but will get stuck in it as soon as they land on the bag. Start with a large clear plastic bottle or milk jug. Attach some string around the mouth of the bottle so it can be hung later. Make a thick sticky liquid with sugar and vinegar. Pour this sticky mixture into the bottom of the bottle. Chop up some appropriate bait into small enough pieces to put it inside the bottle. Fruit is usually a good bet. Poke some additional holes in the jug to give bugs greater access to the bait inside. Hang the trap in a “high-traffic” area for bugs. How it works: They will be attracted by the fruit and fly inside, only to get stuck in the vinegar and sugar mixture. Start with an empty plastic bottle that is in your recycling box. It can be as small as a 500ml bottle, or as large as a two-liter soda bottle. Discard the cap. Cut the top third of the bottle off. It is important to make your cut in the area below the top of the main shaft of the bottle (where it is widest). You should now have a bottle top in the shape of a funnel, and the cylindrical body of the bottle. Invert the bottle top (funnel) into the bottle. It should be a snug fit (given the equal diameter of the funnel top and bottle shaft), but if necessary, secure it with tape. Wrap the bottle with black paper to create a warm dark place for your mosquitoes to go. Place the bottle a short distance away from where you are. This mixture is good for up to a couple of weeks. Change as necessary. Use the same technique as above to construct a bottle trap with the top inverted to make a funnel into the bottle. There is no need to cover the bottle with black paper. Fill the bottom with a sweet liquid. Yellow jackets aren't picky; you can use juice, soda, or just sugar water. (If you wish to repel honey bees, then add a small amount of dish soap and vinegar to the bottom of the bottle before adding your sweet liquid). How it works: Yellow jackets, hornets, and wasps will flock to this bottle (in a big way), will go inside (via the funnel), and will get stuck in the liquid or will become too disoriented to escape. This simple technique works alarmingly well; if you are in a “high-traffic” area, you could end up emptying an entire bottle full of these pests by the end of a few days. Follow the instructions above to make your own plastic bottle trap. Add a ¼ cup of vinegar and a ¼ cup of sugar to the bottle. Finish filling the bottle to just below the funnel bottom (which was formerly the bottle top) with water. Using the same bottle trap technique, apparently all fruit flies need is vinegar to get in and get stuck. If you don't have a plastic bottle handy, you can use a glass jar and poke holes in the lid large enough for your pest of choice to get in. Combine flour and borax, and apply to ant-heavy areas. Alternately (or additionally), growing herbs like spearmint, tansy, and southernwood can repel ants. Mix flour, borox, and cocoa powder and strategically bait problem areas. Make a spray with water and rhubarb. This is actually poisonous to many garden insects, and when sprayed on your garden will act as a natural pesticide. Mix together flour and cement mix, and bait problem areas. Be sure to leave a water source nearby too. How it works: The rodents will be attracted to the flour and will eat it (along with the cement mix too). When the rodents drink water, the cement mix will actually start to turn into cement…thus killing the critter. While this may seem cruel (it is no more or less humane than poison), if you are the sort of person who would use poison if it weren't for the danger to domestic animals, then this may be a solution. If a dog or cat eats a rodent poisoned with cement, they will not be poisoned themselves. However, if they directly eat the flour and cement mixture (which they shouldn't be attracted to, but you never know), there could be problems. Prudent caution is advised. If you would rather simply repel insects in a natural and inexpensive manner, apply some vanilla extract or vanilla essence to your pulse points. Not only will you be bug-free, but you'll smell good too! I know there are more insect traps and repellents out there. Feel free to share your best homemade secrets for staying pest-free in the comments! Oddly enough, I have also heard that spraying listerine around the area where you are going to be will keep mosquitos away! I used it, it done very good and I did pass it on to others. in the house, with a few sprinkles of candy, spiders, ants and others nightly bugs will crawl on this and stick for ever. one one but many. place it in a corner where no one will see or step on it. this gives you an idea where they roam all the time. I have great luck with a product from Avon called Skin So Soft. It is a body oil normally used after bathing. 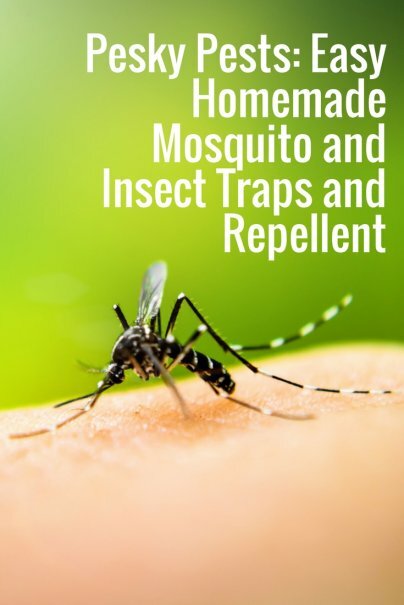 Spread it on exposed skin when outdoors and mosquitoes will leave you alone. You smell great and the kids like it too. Very effective. There are several different kinds to choose from, but the original (in the green bottle) works best. Skin so soft DOES NOT work on Jersey Shore greenhead flies. It's more of an attractant; We used skin so soft one night, and woke up covered with bites. @terry zane - Excellent! Good to know. I like the sticky mouse pad idea - easily harnessed and customized with some of the techniques above too. @judy - I love Avon Skin-so-soft very much for an off-the-shelf product that does the trick. Just remember that the leaves of the rhubarb are poisonous to humans as well. Do you have any pictures of how these do-it-yourself items are supposed to look? Gee girl, you are smart. P.S. Save the wasps, stop kilem. @Ami - Thanks! Hope you can make good use of these tricks. And although I'd love to be responsible enough not to kill wasps, I have yet to find a way to deter them from being around me (and I'm allergic to them) without doing so. Any tips are welcome! Very interesting combos for repellants. Love the info. Thanks for sharing. Great alternative ways to get rid of pests if you run out of repellent! 1/2 vodka 1/2 water is a spray bottle is a great way to ward off bees and flies. Very handy as I am currently trying to find ways to captures insects for science experiment/project. did i completely miss it or is there not something used for spiders? If you want to humanely get rid of rats or mice, you'll need a small trashcan or 5 gallon bucket, a cardboard box, and some peanut butter. Cut a 3 inch strip of cardboard about 4 inches longer than you would need to make a ramp from the ground up to them top of the bucket. Now, make that ramp, and bend the excess back and forth so that it will fall under light weight. Put a dollop of peanut butter on the end of the cardboard and when they try to get it they fall in and can't escape. Release them far from your home. I caught a mouse in 15 minutes of doing this! Not to bad of ideas, but the one listed above doesn't work for wasps. Tried it last summer in an attic full of them. They ignored it. For those pesky small ants one of the best ways to get rid of them in your lawn is with instant grits, just sprinkle it around the ant hills and in about a week the ants are gone. has anyone tried this in apple trees as alternative to pesticides? Should be borax, not borox. Thanks for the article. Sounds interesting. I have a problem in a rental unit with wasps congregating on the balcony. The hotter weather has been attracting lots of mosquitos around my home. Thanks for the post of the homemade traps! These are awesome. I think I will use these methods combined with the new smart trap I bought through amazon. Bothe methods work great!!! 2.Exterminating or killing gnats – it’s the method of eliminating adult gnats that ar left when cleanup and destroying their breeding sources. this can be a crucial method in obtaining obviate gnats from your house since we tend to had already destroyed the breeding place of gnat and going away them no place to get eggs and hatch.